Selective pallet racking is the most commonly used pallet racking system. These systems are called “selective” because they allow users to select any pallet load from the pallet racking system without having to move any other pallets. 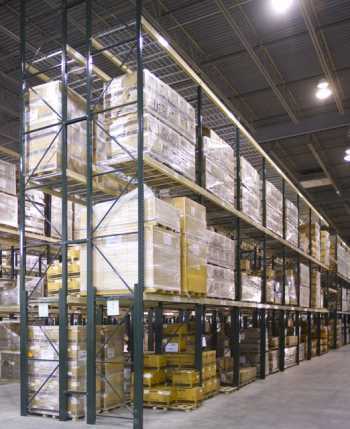 Selective pallet racking systems are the least expensive variety available, based on cost-per-pallet position. For Selective Pallet Rack in Chicago, Illinois, and the Mid-West states, CSI is the logical choice as a partner to assist in meeting your needs. We can provide Selective Pallet Rack from the manufacturer you have standardized on. If you do not have a prefered Selective Rack manufacturer, we would strongly suggest Speedrack and Steel King. Speedrack and Steel King are both exceptional Selective Pallet Rack manufacturers and we have immediate access to both. Both types of selective pallet racking feature welded trusses and high capacity beams for superior quality and stability. Container Systems sells complete selective pallet racking systems as well as add-on units and individual components to expand your existing pallet racks. If you’re unsure which type of selective pallet racking is right for your needs, please contact us. We’ll help you find an ideal pallet racking system that meets your storage needs and fits your available warehouse space. Request a quote on selective pallet racking for your facility, or contact Container Systems for more information.